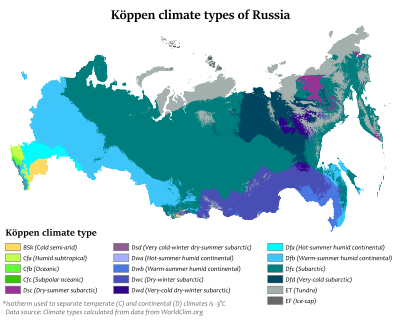 The climate of Russia is formed under the European peninsula. The enormous size of the country and the remoteness of many areas from the sea result in the dominance of the continental climate, which is prevalent in European and Asian Russia except for the tundra and the best extreme southeast. Mountains in the south obstructing the flow of cold air masses from the Arctic Ocean and the plain of the south and north makes the country open to Pacific and Atlantic influences. Due to the moderating influence of the Atlantic or Pacific, most areas of the country in European Russia, in the south of West Siberia and in the south of the Russian Far East, including the cities of Moscow and Saint Petersburg, experience a humid continental climate. (Köppen's Dfb, Dfa, Dwb, Dwa types). 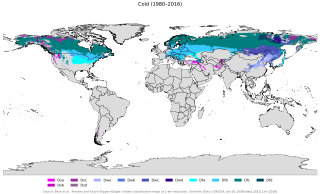 Most of Northern European Russia and Siberia between the Scandinavian Peninsula and the Pacific Ocean has a subarctic climate, with extremely severe winters (Dfd, Dwd) in the inner regions of Northeast Siberia (mostly the Sakha Republic, where the Northern Pole of Cold is located with the record low temperature of −69 °C or −92.2 °F), and more moderate (Dwc, Dfc) elsewhere. The strip of land along the shore of the Arctic Ocean, as well as the Arctic islands, have a polar climate (ice cap climate (EF) on some of the islands and tundra climate (ET) elsewhere). A small portion of the Black Sea coast, most notably in Sochi, possesses a humid subtropical climate (Köppen's Cfa) with unusually wet winters. Winter is dry compared to summer in many regions of East Siberia and the Far East (Dwa, Dwb, Dwc, Dwd types), while other parts of the country experience more even precipitation across seasons. Winter precipitation in most parts of the country usually falls as snow. The region along the Lower Volga and Caspian Sea coast, as well as some areas of southernmost Siberia, possess a semi-arid climate (BSk). The city of Kaliningrad has an Oceanic climate (Cfb) due to its relatively mild (avg. above -3C) winters and cool summers. About 65% of the Russian territory is underlain by permafrost. ^ "Climate". Library Of Congress. Retrieved 2007-12-26. ^ "Pogoda.ru.net" (in Russian). Retrieved May 7, 2013. ^ "Meteo.ru". Retrieved May 7, 2013. ^ "NOAA NCDC Climate Data Online". Retrieved May 7, 2013. ^ "Pogoda.ru.net" (in Russian). Retrieved July 5, 2013. ^ "Pogoda.ru.net" (in Russian). Retrieved July 7, 2013. ^ "Pogoda.ru.net" (in Russian). Retrieved 2009-02-08. ^ "Pogoda.ru.net" (in Russian). Retrieved September 7, 2007. Taiga, generally referred to in North America as boreal forest or snow forest, is a biome characterized by coniferous forests consisting mostly of pines, spruces, and larches. The subarctic climate is a climate characterised by long, usually very cold winters, and short, cool to mild summers. It is found on large landmasses, away from the moderating effects of an ocean, generally at latitudes from 50° to 70°N poleward of the humid continental climates. These climates represent Köppen climate classification Dfc, Dwc, Dsc, Dfd, Dwd and Dsd. In very small areas at high altitudes around the Mediterranean Basin, Iran, Kyrgyzstan, Tajikistan, Turkey, Alaska and other parts of the northwestern United States and Russian South-Eastern regions the climate is classified as Dsc with a dry summer climate, such as in Seneca, Oregon or Atlin, British Columbia. Khatanga is a rural locality in Taymyrsky Dolgano-Nenetsky District of Krasnoyarsk Krai, Russia, located on the Khatanga River on the Taymyr Peninsula. It is one of the northernmost inhabited localities in Russia. Its elevation is 98 feet (30 m) above sea level. As of the 2002 Census, its population was 3,450. Khutag-Öndör is a sum (district) of Bulgan Province in northern Mongolia. Tarialan is a sum of Khövsgöl aimag. The area is 3,431 square kilometres (1,325 sq mi), of which 1,582 square kilometres (611 sq mi) are pasture and 167 square kilometres (64 sq mi) are arable land . In 2007, Tarialan had a population of 5,855 people. The sum center, officially named Badrakh, in 2007 had 2,981 inhabitants and was the 2nd most populous settlement in the aimag after its capital. The sum center is located 160 kilometres (99 mi) east of Mörön and 521 kilometres (324 mi) from Ulaanbaatar. Bayangol is a sum (district) of Selenge Province in northern Mongolia. The capital town of the district is officially named Baruunkharaa. Moscow has a humid continental climate with warm, sometimes hot, somewhat humid summers and long, cold winters. Typical high temperatures in the warm months of June, July and August are around 23 °C (73 °F), but during heat waves, which can occur anytime from May to September, daytime temperature highs often top 30 °C (86 °F) for sometimes one or two weeks. In the winter, temperatures normally drop to approximately −10 °C (14 °F), though there can be periods of warmth with temperatures rising above 0 °C (32 °F). Summer lasts from mid-May to the beginning of September. Winter lasts from the beginning of November to the end of March. The Kola Peninsula tundra ecoregion is an ecoregion that covers the northeastern half of the Kola Peninsula, along the coast of the White Sea, a marginal sea of the Arctic Ocean. The maritime effects of the White Sea create a milder climate than would be expected for a region of this latitude. It is in the Palearctic ecozone, and the Tundra biome. It has an area of 58,793 square kilometres (22,700 sq mi). The Northeast Siberian coastal tundra ecoregion is an ecoregion that covers the coastal plain of the central north region of Siberia in Russia. This coastal region borders the Laptev Sea and the East Siberian Sea, both marginal seas of the Arctic Ocean, from the Lena River delta in the west to the Kolyma River delta in the east. There are several large river deltas in the area that support breeding grounds for 60 to 80 species of migratory birds. The region is in the Palearctic ecozone, and the Tundra biome. It has an area of 846,149 square kilometres (326,700 sq mi).